Mmmmm, this question comes at just the right time. Today it was raining off and on over the already frozen ground that is Idaho in the winter. Freezing rain, y’all. But you know what’s best during freezing rain? Soup. And today I’ll tell you my favorite food is the meal I make for my husband and I while we curl up on the couch and watch A Young Doctor’s Notebook and wait out this dreadful weather. The only thing on tonight’s menu was soup, but it was a delicious one. 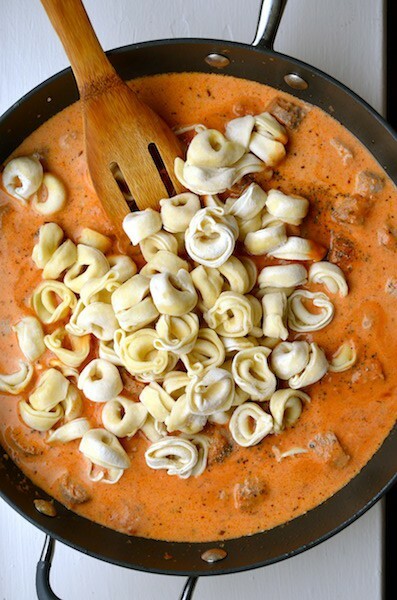 Tomato Basil Soup with Three Cheese Tortellini. I forgot to take a picture of it before my husband so kindly put it all away for our lunches tomorrow. But the original recipe I started using is from Rachel Schultz on A Household Almanac. I, of course, have modified it. Not to make it any better, but to satisfy my laziness. I didn’t measure anything. I made a giant pot of this to make sure we’d have lots of leftovers. 2 packages of Bertolli Tortellini cooked al dente. Heavy Cream – a splash? Just enough to make it the color I wanted. What’s your favorite thing to cook on a cold day? I am also all about the unspecified measurements… No sticking to a recipe for me! Make it how you like it 😀 I am so trying this. Ahh this looks so goooood! My husband and I are soup fanatics. The easiest soup in the world to make is an orzo vegetable soup (if I remember correctly though…you’re not a fan of vegetables? ), but I also love to make Italian Wedding Soup. Andd…now I want soup and it’s 9:30 in the morning. I want to like vegetables so badd!!! I am less picky about veggies when they are in soups because the textures are a lot milder. I love making this spicy! One of my faves.